This adapter is for vehicles equipped with the Smart Phone Integration or BMW APPS factory options. For vehicles with Smart Phone Integration, this adapter not only charges the phone, but allows access to any music or MP3 files stored on the phone. In addition, it provides a connection to the roof mounted telephone antenna on your car for improved cellular reception. For vehicles with BMW APPS, this adapter is required to fully utilize all features of this option. In addition to the great features noted for Smart Phone integration, it allows you to use the "PlugIn" as well as the "Video Playback" features. 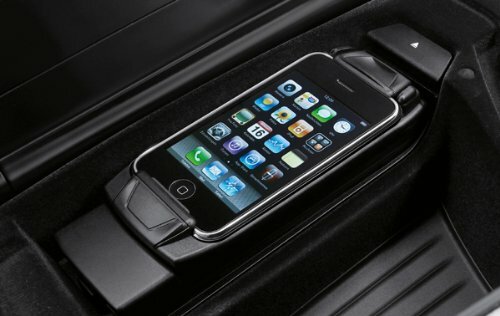 To ensure a phone is supported and compatible with the vehicle, refer to the list of tested phones available at http://www.bmwusa.com/Standard/Content/Owner/BluetoothTechnology Only applicable to vehicles produced after 9/2010 and equipped with either Smart Phone Integration (option code 6NF) or BMW APPS (option code 6NR). BMW APPS is compatible only with iPhone 3GS, iPhone 4 and iPhone 4S.